Eerie images have emerged online showing the inside of a creepy abandoned art gallery so ‘haunted’ even the security guard working next door won’t step inside. 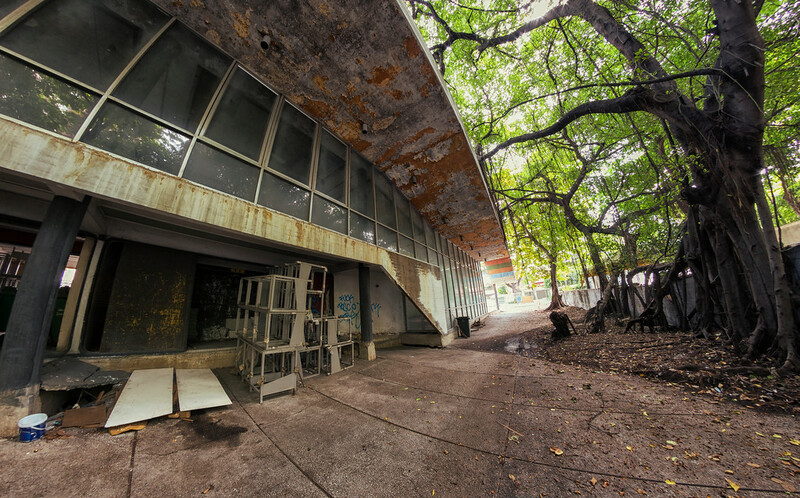 The Bhirasri Institute of Modern Art in central Bangkok, Thailand, opened its doors in 1974 led by a group of Thai and expat artists. The gallery featured works donated by artists from around the world, many of which were worth millions. Named after Italian-born sculptor Sipla Bhirasri, who later became known as the ‘father of Thai modern art’ after moving to Bangkok, the gallery closed in 1988 and the artworks were moved elsewhere. Today all that remains is a crumbling facade, a haunted metal spiral staircase and graffiti covered grey walls coated in mud and dirt. Rather than being home to some of the best works of art in the world, the gallery now houses stray cats, plenty of rats and squatters desperately seeking shelter from the hot Bangkok sun. The building is also used as storage for odds and ends including rubbish bins. 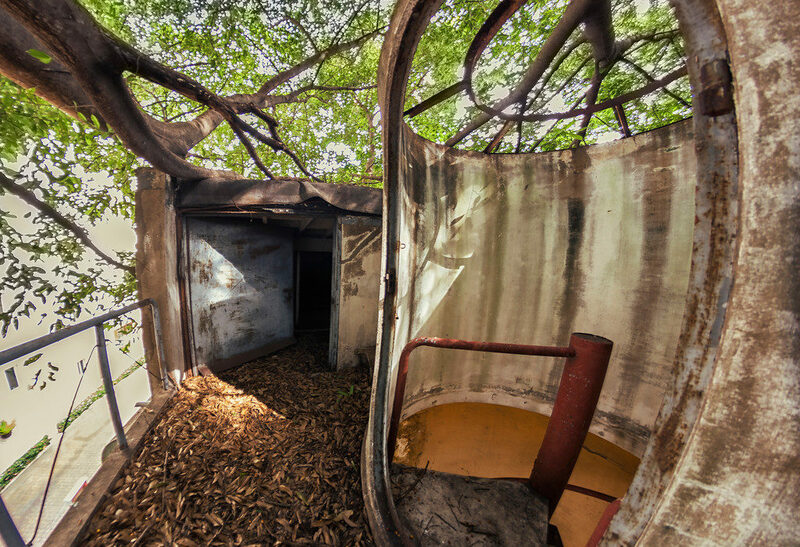 American photographer Dax Ward decided to capture the decaying of the once renowned museum as he travelled the world in search of abandoned buildings. Walking past the gallery, which sits on a road just off the beaten track in the great city, Ward was immediately struck by its mystery. Shrouded by trees, the gallery is practically hidden from sight meaning many in the upmarket neighbourhood that surrounds is aren’t even aware it exists. Deciding this would be a perfect place to capture decay, Ward immediately wanted to go inside. However, the Bangkok-based photographer was warned by the security guard working next door. The guard told Ward something bad had taken place in the building and he would not accompany them in. The security guard said to go ahead as he didn’t care if we entered. However, he said that he would not set foot in the site as he thought it to be haunted. 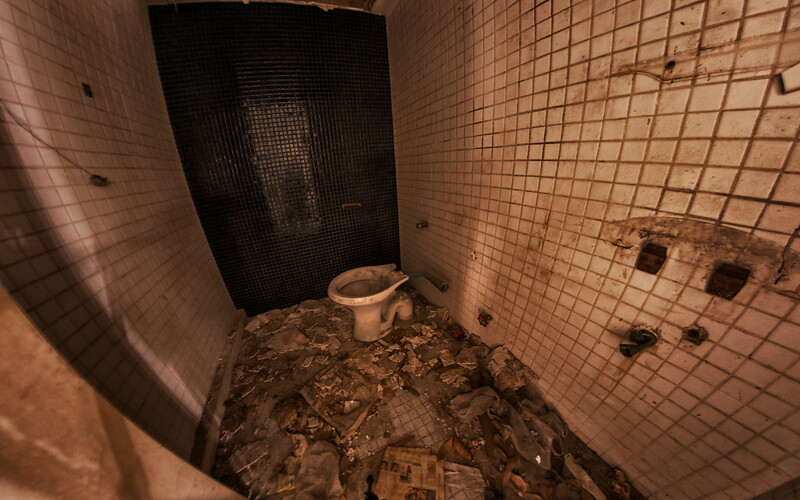 The more surprising find was a man with no shoes or shirt who looked very dishevelled, simply crouching in the centre of one of the interior rooms, staring at the floor. That sounds much scarier than a ghost! 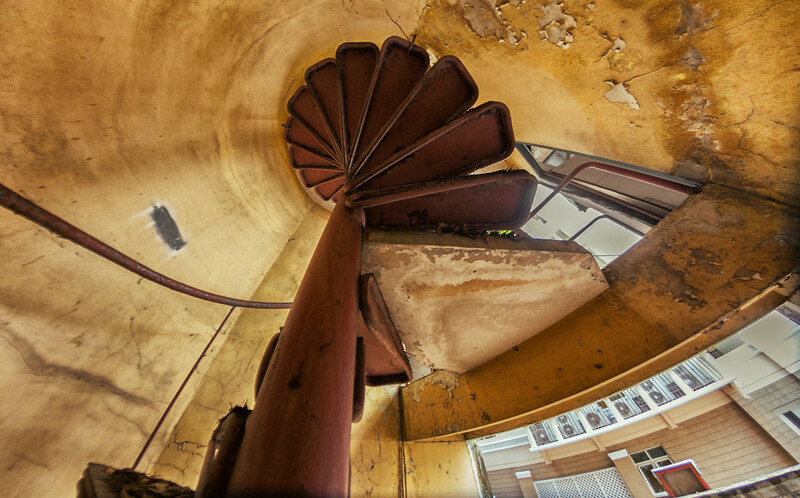 Moving past this strange sight, Ward found a red spiral staircase, just rusting in the centre of the building. I was concerned about my footing collapsing underneath me or steps on the spiral staircase breaking, as some were loose. 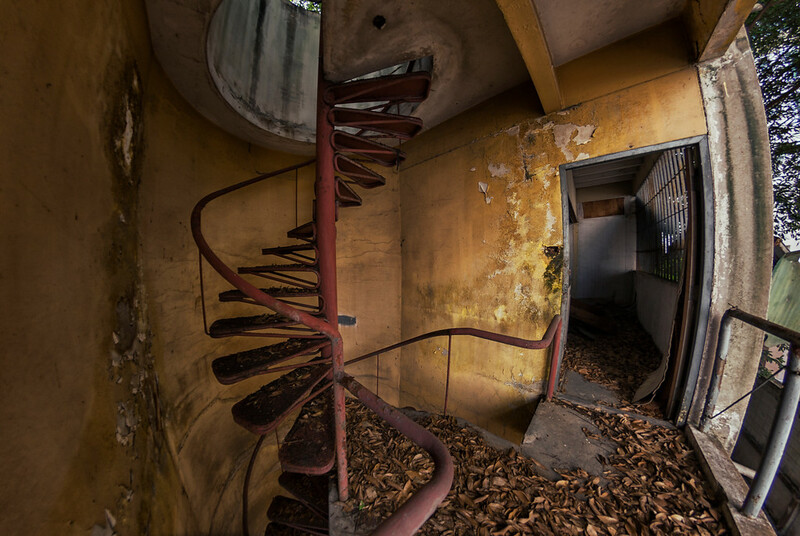 As he walked up the spiral staircase, Ward ended up on the roof which was covered in bent and crooked trees allowing only a small amount of sunlight into the building. I’m not sure that will pass health and safety regulations these days! It is a shame a building like this has fallen into disrepair, although you could argue even in its decaying state it is still a beautiful work of art. 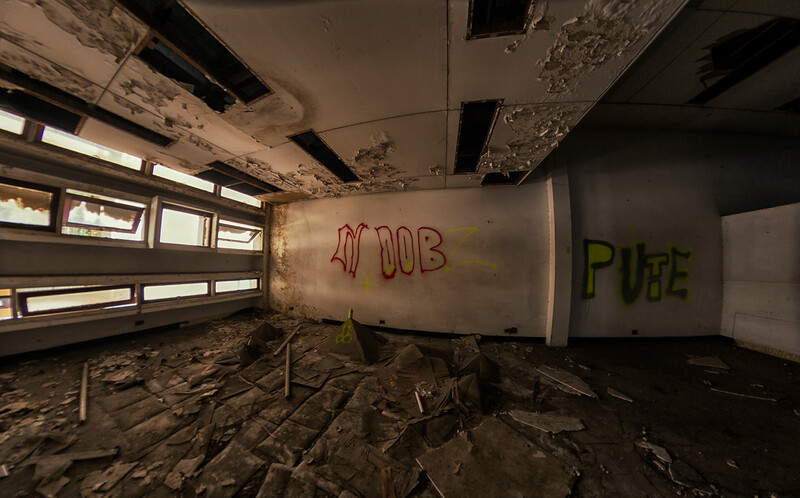 To check out more of Ward’s photography of abandoned buildings around the world, then visit his website.